Chart Wealth... Disk Drive Index Goes Into Overdrive! January 2006, Volume 3 Issue 1 Know It - Profit! "Disk Drive Index Revs-Up Profits"
The Airline sector and the disk drive index ring-in the new year with strong trends. Which is your best play? We'll find out. Good news! All the indices finished the year in positive territory. The Russell 2000 (^RUT) was able to finish the year with a modest gain of 9.79 percent. The Nasdaq Composite (^IXIC) and the Standard & Poor's 500 (^GSPC) ended up 5.59 and 5.24 percent, respectively. The Dow Jones Industrials (^DJI) managed to stay in the black with a 1.07 percent gain. The AMEX Airline Index (^XAL) has taken off... up 44 percent since September 2005! The AMEX Disk Drive Index (^DDX) is up 248 percent since its low in October 2002. Now, it's poised to break to a fresh two-year high. 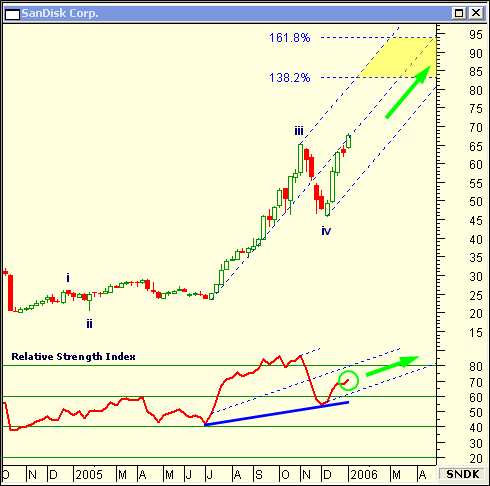 Currently, SNDK is moving up in an intermediate-term fifth Elliott wave on the weekly chart. The Fibonacci price extension from the third Elliott wave is forecasted to reach the $83 to $94 price range. The trend continues to be strong with the relative strength index moving up through 70. You may have noticed some sectors will lead for two or three months at a time... while, others will go in and out of favor within the span of a few weeks. When evaluating sectors and stocks, you must apply your analysis to different time periods in order to get a more accurate picture of likely future price action. Ideally, each time frame should be in agreement before you place your order. promise to use it only to send you Chart Wealth. Subscribing will not result in more spam. Download Your FREE Special Report, Now! Stock-Charts-Made-Easy.com is not an investment advisory service, a registered investment advisor or broker-dealer and does not imply or suggest which securities you should buy or sell. You should always check with a licensed financial advisor and/or tax advisor to determine the suitability of any investment. It should not be assumed the technical indicators, analysis techniques or trading methods presented in this newsletter will be profitable or that trading decisions based on their use will not result in losses. Past results are not necessarily indicative of future results. Examples presented in this newsletter are for educational purposes only. Any trade set-up illustrated is not a solicitation to buy or sell a security. The author, publisher and any affiliate linked to this newsletter assume no responsibility for your trading results. Remember... there is a high degree of risk in trading. CFTC RULE 4.41 - HYPOTHETICAL OR SIMULATED PERFORMANCE RESULTS HAVE CERTAIN INHERENT LIMITATIONS. UNLIKE AN ACTUAL PERFORMANCE RECORD, SIMULATED RESULTS DO NOT REPRESENT ACTUAL TRADING. ALSO, SINCE THE TRADES HAVE NOT ACTUALLY BEEN EXECUTED, THE RESULTS MAY HAVE UNDER- OR OVER-COMPENSATED FOR THE IMPACT, IF ANY, OF CERTAIN MARKET FACTORS, SUCH AS LACK OF LIQUIDITY. SIMULATED TRADING PROGRAMS IN GENERAL ARE ALSO SUBJECT TO THE FACT THAT THEY ARE DESIGNED WITH THE BENEFIT OF HINDSIGHT. NO REPRESENTATION IS BEING MADE THAT ANY ACCOUNT WILL OR IS LIKELY TO ACHIEVE PROFITS OR LOSSES SIMILAR TO THOSE SHOWN.